“Josh was one of the wisest people you would ever meet. When you talked to him, you hoped you would be lucky enough to retain some of that wisdom, but you had to make the effort as he never forced it on you. But every word he spoke was from one of the kindest, most thoughtful and well-centered folks you could hope to have in your life. And then there was the fantastic joke that people that didn’t know him fell for every time. Here was this scary looking dude that was a complete contradiction of his appearance. I think everyone felt a little ashamed and learned from that. We were all so proud to have him as our ambassador to the world. He was as 9:30 as 9:30 gets. 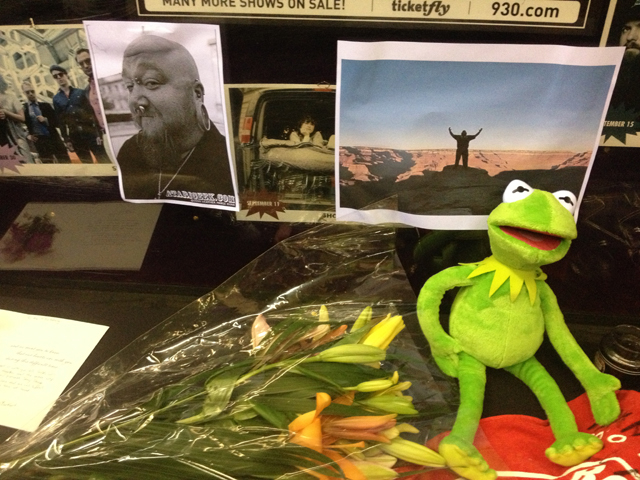 Visitors left an impromptu memorial to Burdette in the lobby of the 9:30 Club, where some placed flowers and notes.